Jasmin has made some progress on the Baby Vertebrae (it also comes in an adult size ). 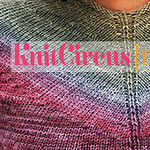 Jasmin bought the rainbow and sky colored yarn in the colorway "Nothing says Screw You like Rainbows in a Cloudy Sky". Jasmin calls it "Nothing says 'I love you' like a rainbow", from White Birch Fiber Arts. Gigi finished blocking the Mini Waters Edge, and she has cast on her Viajante, in Kilimanjaro yarn from Miss Babs, in the Drift in a Dream colorway. 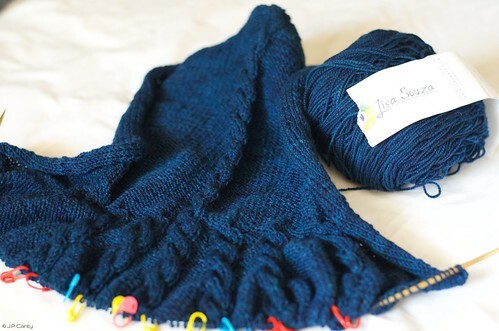 Jasmin mentions the Kapuzin sweater, out of Lisa Souza yarn in color that works for Genevieve and Beanzilla as well. So she bought yarn in her Hardtwist, in the St Louis Blues colorway. She is using many stitch markers. Jasmin also talks about setting the colors of the Baby Vertebrae to make sure the colors don't run. Gigi remembered that the socks she was putting on had a tubular cast on and she decided to do a lot of socks with the tubular cast on. She mentions the adult safari socks from Sockoholic Yarn by Knitters Brewing company in the Tiger Stripe colorway, and is doing the cuffs in black with the tubular cast on, from Lucy Neatby's Cool Socks Warm Feet. She also cast on a pair of Trekking vanilla socks. Gigi also is working on preemie hats, and is doing an adaptation of the Jared Flood's Turn A Square hat. Jasmin was stuck at a coffee shop for an hour and a half with no knitting. Jasmin mentions Natalie from Mastering the Knits and Wonderful Wallaby by Cottage Creations. Gigi finished spinning her colorful fiber on the Jenkins Turkish Lark, and plied it. Gigi will sew ribbon into the dress she sewed for Melanie' of the Savvy Girls, so it won't fall off the hanger. I love the Kapuzin Hoodie. I wish it came in adult sizes. It looks like it has just a little swing in the back, which would be very flattering for me, at least.